We believe there are good times and bad times to invest in the market. With this key perspective in mind, we believe investors need to allocate their irreplaceable or serious money into a strategy that can play defense in volatile markets like the one we saw during the crash of 2008. You can then complement this defensive core strategy with additional strategies to manage various objectives or specific investment preferences. By matching your Required Rate of Return (needed to address your goals) and your Risk Score to one or more of our disciplined, rules-based investment strategies, we can help you build a proactively managed portfolio designed to both pursue your goals and also provide protection against catastrophic losses. Education is the key to knowledge and we want you to have every opportunity to understand our investment process and strategies because these important financial decisions directly impact your life. Once you have a thorough understanding, we’ll make recommendations on strategy allocations and implement your personalized plan. This personalized investment plan, and underlying strategy selection, is based on a combination of your Required Rate of Return (needed to address your goals) and Risk Score. This process allows us to manage your portfolio with the ongoing, proactive service and personalized direction it needs to pursue your goals. Disciplined, rules-based investment strategies are the foundation of our investment management approach. Our process-driven, proprietary investment strategies are solely dependent on the time-tested, objective research of our research partners, which include Dorsey, Wright & Associates and Morningstar. Being rules-based and systematic allow our investment strategies to operate independent of subjective emotions or individual judgement calls. Our strategies continually focus on the ongoing and ever- changing investment landscape, allowing you to focus on the things that matter the most to you. We believe making money is important, but protecting that money is just as important, if not more. 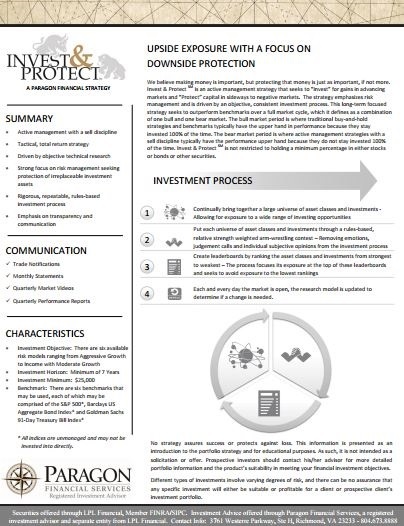 Invest & Protect SM is an active management strategy that seeks to “Invest” for gains in advancing markets and “Protect” capital in sideways to negative markets. The strategy emphasizes risk management and is driven by an objective, consistent investment process. The ROTATE strategy puts a greater emphasis on long-term growth than it does short-term preservation. We believe different sectors of the economy tend to perform better than others depending on where we stand in a given economic cycle, market cycle or even calendar year. There exists opportunity in trying to overweight the strong sectors and underweight the weak sectors. 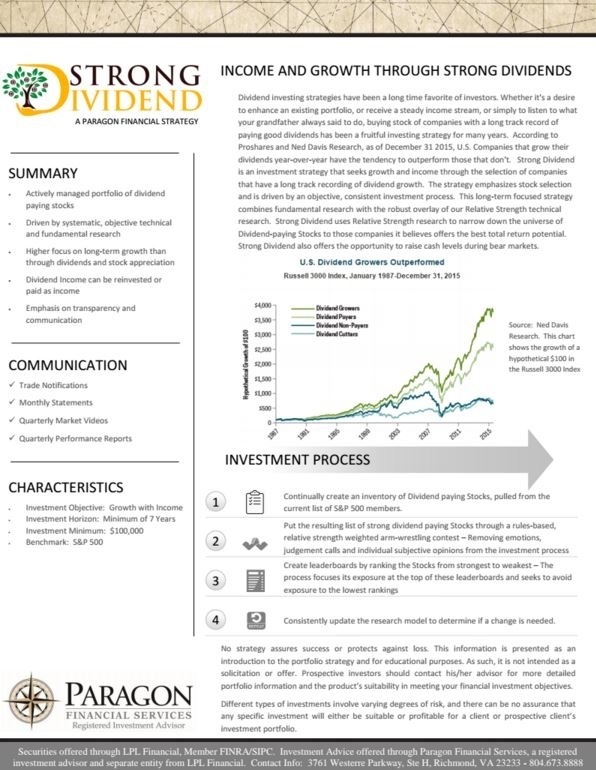 Dividend investing strategies have been a long time favorite of investors. Whether it's a desire to enhance an existing portfolio, or receive a steady income stream, or simply to listen to what your grandfather always said to do, buying stock of companies with a long track record of paying good dividends has been a fruitful investing strategy for many years. 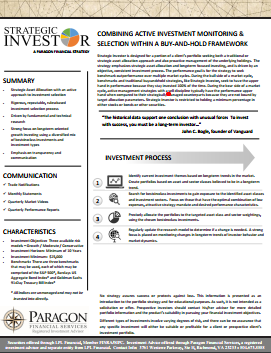 Strategic Investor is designed for a portion of a client’s portfolio seeking both a traditional or strategic asset allocation approach and also proactive management of the underlying holdings. 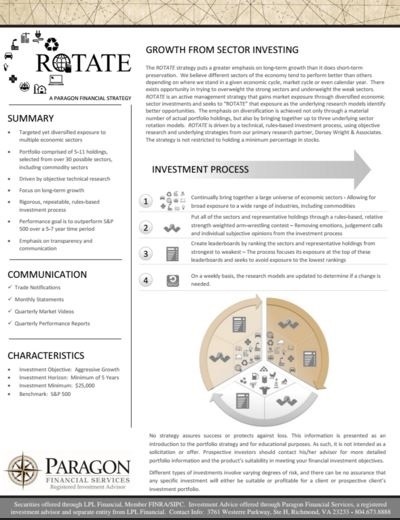 The strategy emphasizes strategic asset allocation and long-term focused investing, and is driven by an objective, consistent investment process. Since 1931, American Funds has helped investors pursue long-term investment success. Their time-tested funds have maneuvered the ups and downs of numerous market cycles. 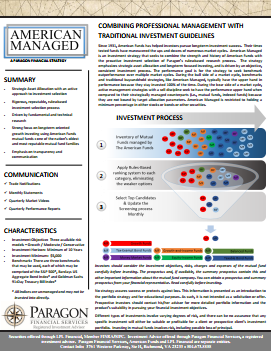 American Managed is an investment strategy that seeks to combine the strength and history of American Funds with the proactive investment selection of Paragon’s rules-based research process.